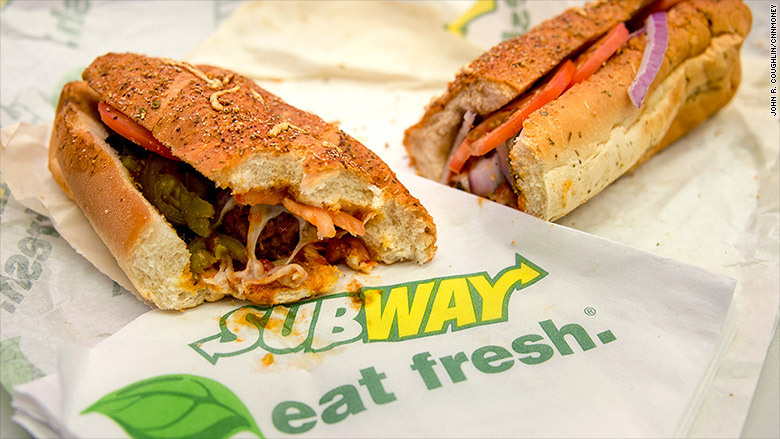 Subway is the latest fast food chain to purge artificial ingredients from its menu. Subway has become the latest restaurant chain to purge artificial ingredients from its menu. Subway vowed to remove all artificial colors, flavor and preservatives from its North American sandwich shops over the next 18 months. The company has already begun the process with the introduction of a new roast beef without artificial colors, flavors or preservatives and also by eliminating trans fats, the company said. The process will continue in August with a "new, improved" ham devoid of artificial ingredients, Subway says. Subway is joining a trend that has swept through the fast food industry in recent months. Last week, Pizza Hut said it was getting rid of artificial colors and flavors from its pizzas by the end of July. Taco Bell said it was getting rid of artificial colors and flavors, and also trans fats, by the end of the year. Both restaurant chains are owned by Yum! Brands (YUM). Last month, Panera Bread (PNRA) promised to get rid of artificial additives and preservatives. In April, Chipotle (CMG) became the first fast food chain to claim that its food is GMO-free.